Well this was supposed to be a 2 for 1 tuesday, but I’m not getting around to the post until after midnight, so now it’s just two drinks without the snappy title. So today we’ve got two interesting cocktails, one much better than the other. Stir with ice and strain into a chilled cocktail glass. Hypnotized by the color…so your think it’s better than it is. So next up we’ve got something much better. 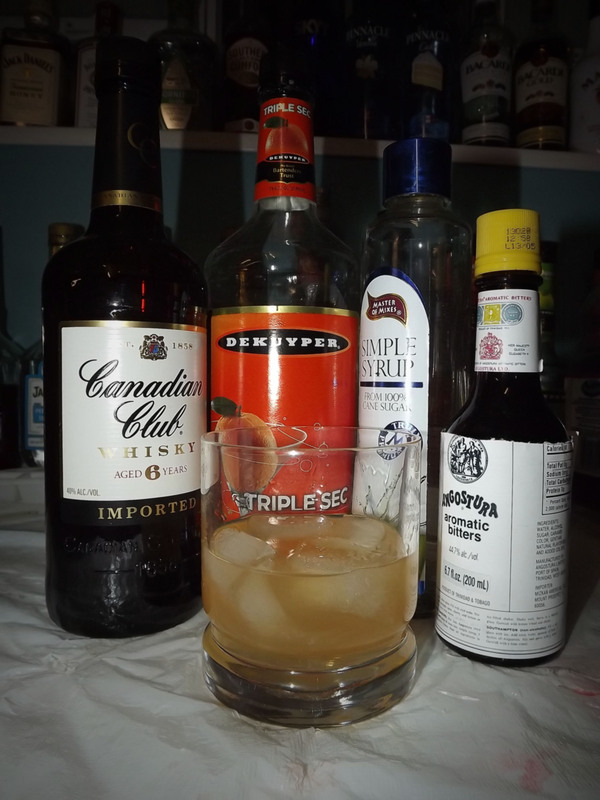 The “.44 Magnum” is a powerful mix that doesn’t quite taste as powerful as the ingredients at work here. 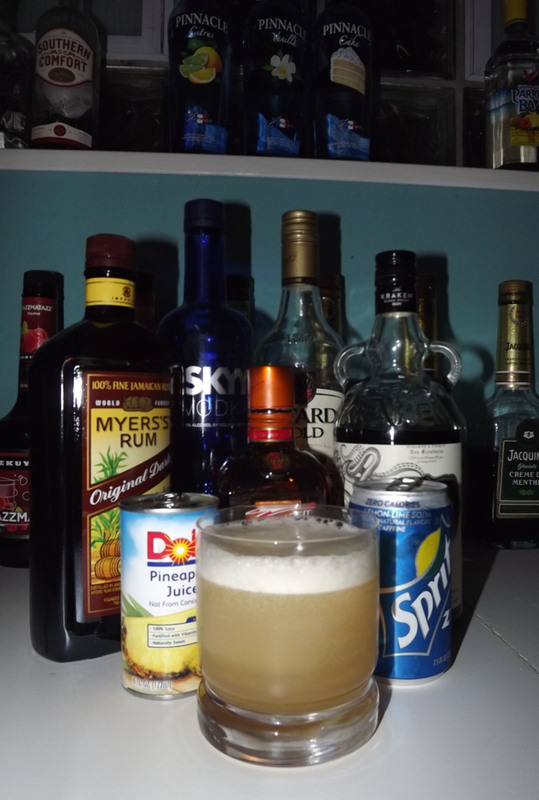 The topping of 7Up/Sprite makes for a citrus fizz aroma and start to the drink. Mid pallete is a sweet/sour rum, followed by a Jamaican dark rum finish with a hit of pineapple. 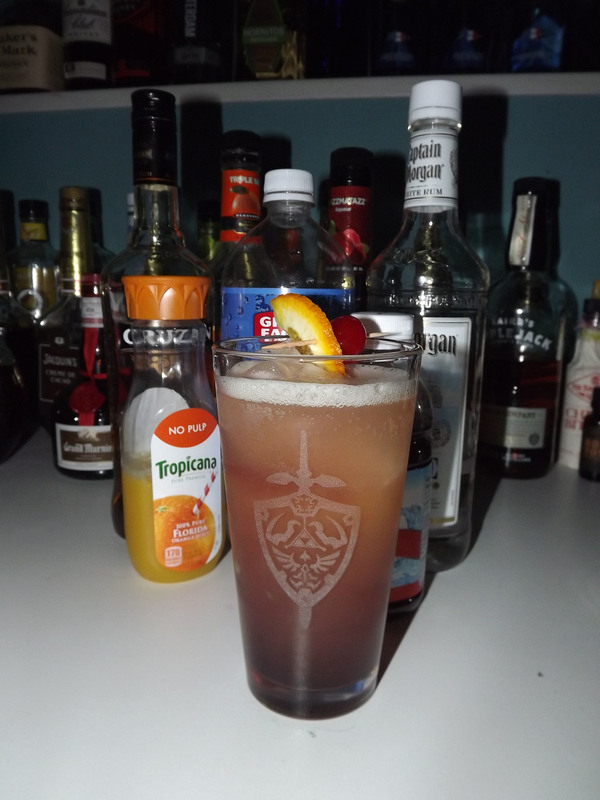 Due to the less than appealing color and presentation in this drink, an opaque tiki glass would probably be better than the listed “bucket glass” in my recipe book. Shake all but sprite with ice. Strain into an iced tumbler (or tiki glass). Top with sprite. Today I’m highlighting one of my current favorites. 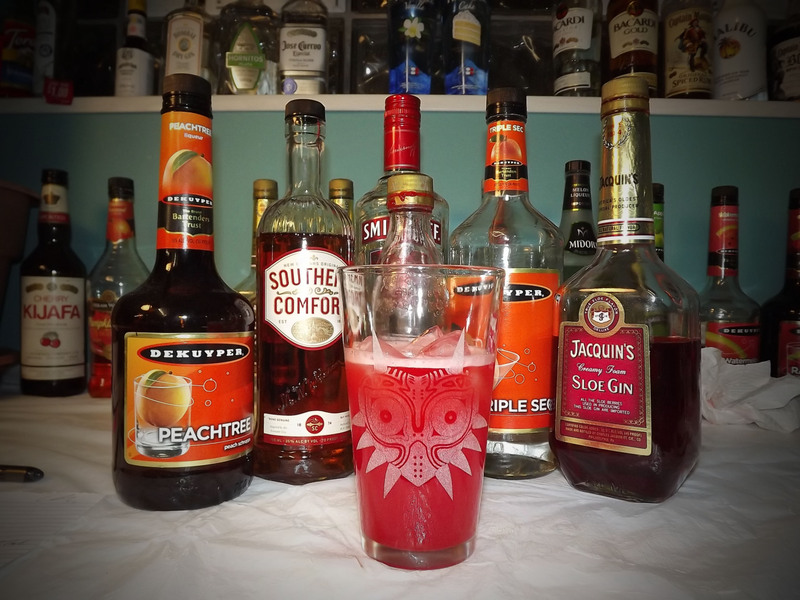 The “Cold Fusion” is a delightful sweet, sour, and melon flavored drink with a great all around taste and feel. Built on the core lemon and Midori base, it’s aroma and taste are equally of both ingredients. The drink starts sweet and goes to a mild sour as it hits the back of your mouth. 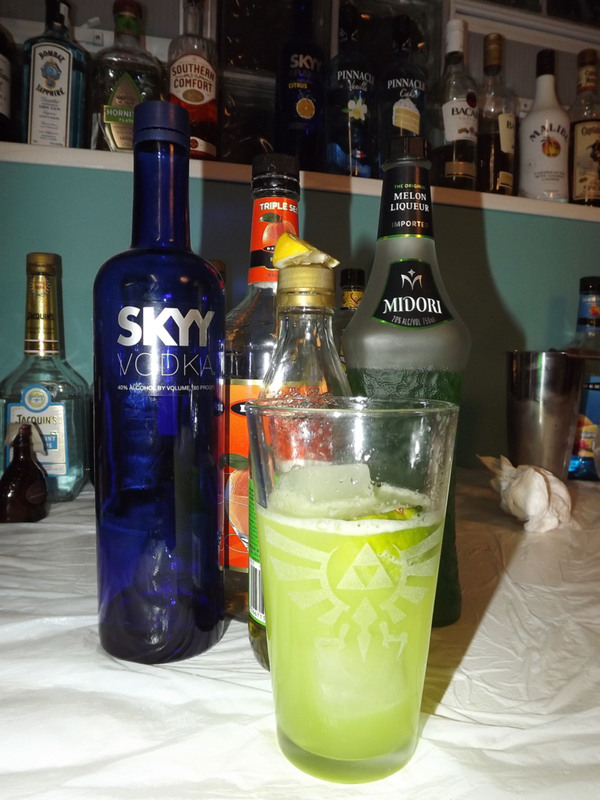 Midori takes center stage, but thanks to the sweet/sour and lemon it doesn’t overpower the drink. 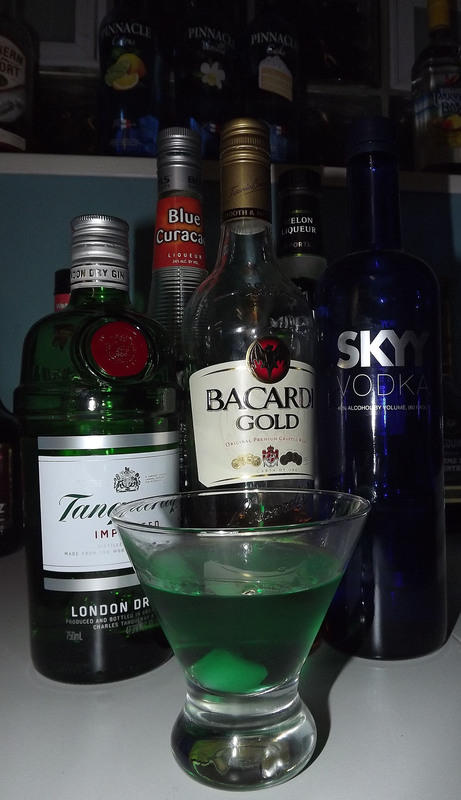 The colorful green makes this somewhere between a late spring and early summer drink, and certainly warrants a place on my permanent menu. ~ A trip through the dusty desert. I’m not even going to talk about how good this drink is. Make it for yourself and don’t ask questions. Straight build in a rocks/bucket glass. Today’s Drink is not only on schedule, but is a potent blast of berry flavor. 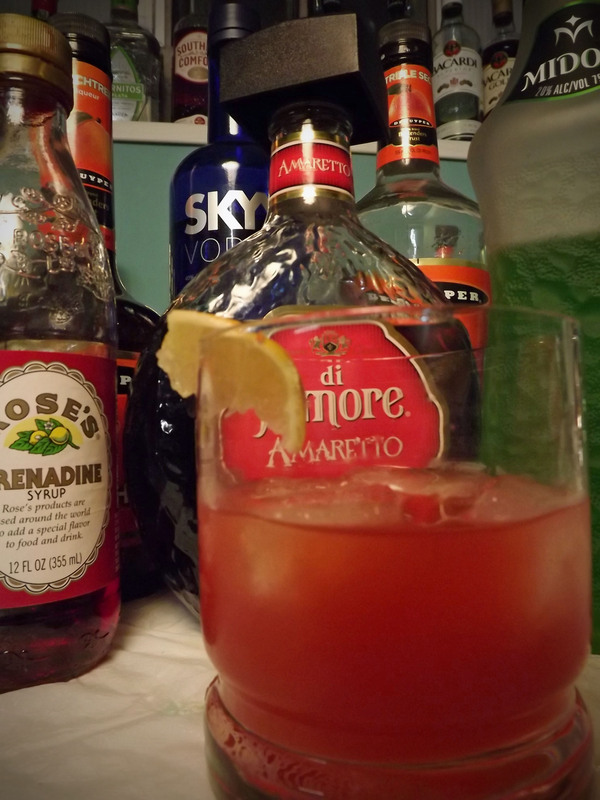 The Red Devil is one of those dangerous mixes, like the “Long Island Iced Tea,” which is sure to get you plastered if you’re not drinking lightly. 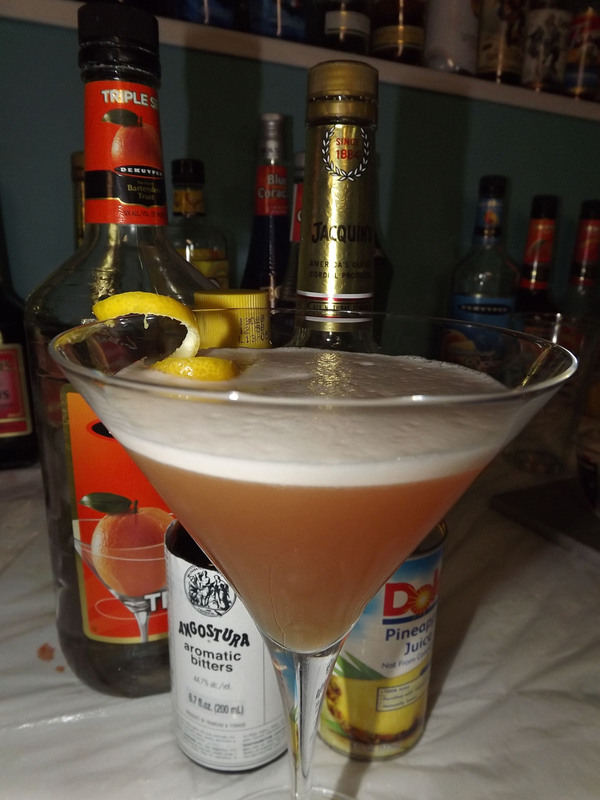 This variation is a half recipe of the Red Devil. that I’m calling the “Red Demon.” The plus to the Red Demon is that it will fit in a pint glass. The Red Devil will not, you’ll have to find something bigger. I figured the Majora’s Mask glass fit the theme of “Demon” quite well. *Update: This drink makes the potency of a Long Island Iced Tea look mild. Watch how fast you’re downing this one.